The body count continues in this vivid thriller, the fourth - but not final - story in the widely successful Friday the 13th series. Jason, Crystal Lake's least popular citizen, returns to wreak further havoc in Friday the 13th: The Final Chapter. After his revival in a hospital morgue, the hockey-masked murderer fixes his vengeful attention on the Jarvis family and a group of hitherto carefree teenagers. Young Tommy Jarvis is an aficionado of horror films with special talent for masks and make-up. Has the diabolical Jason finally met his match? With the possible exception of The Neverending Story, 1984’s Friday the 13th - The Final Chapter might stand as the most deceptive movie title ever. I don’t think it qualifies as a spoiler to reveal that the series kept going long after the conclusion of this flick. Including 2003’s Freddy Vs. Jason, we got seven more Friday offerings after this fourth one as well as a 2009 reboot/remake. As long as profits remain to be earned, Jason will continue to kill. Whereas Part 2 and Part 3 each opened with the final scenes from their respective predecessors, Final launches with a general recap. It reintroduces the legend of Jason Voorhees (Ted White) and sets the stage for more gore. The flick then picks up right where Part 3 ended, as we see authorities clean up the mess Jason made. The film also shows the apparent demise of the madman, as the coroners cart off his body. Lots of attractive young people out in the middle of nowhere with Jason on the loose - no points if you figure out what happens from there. We watch the usual exposition in which the various characters hang out and engage in frivolous sexual activities. Jason stalks the woods and slowly offs more and more of the characters as we head inexorably toward yet another climactic showdown. Blah blah blah. Why do I get the feeling I could just reiterate the same review for each Friday movie and it wouldn’t matter? That’s not fair, I suppose; since I still have many more movies to go after The Final Chapter, I don’t know what potential surprises may arise. However, the first four Friday movies stay very close to the same template and any story differences among the first four flicks remain minor. Someone kills young adults out in the woods - that’s about it. Most of the characters look and act the same from movie to movie, so the main changes come from the nature of the killings. Otherwise, you won’t find much new in Final Chapter. It introduces a family to the concept; we still have lots of anonymous, horny young adults, but we also get little Tommy and his mother. Not that their presence does anything to alter the normal dynamic; the twist fails to add up to something fresh, though it does mean the film’s ending presents a moderately different take on things. One change comes from the identity of the director. Steve Miner helmed the prior two flicks, but here Joseph Zito takes over for him. Don’t expect this to make any difference, as the movie remains clumsily paced and put together. The films always telegraphed scary moments, and that continues here, as Zito makes sure we see the jumps and jolts from a mile away. Another unintentional difference revolves around the cast. For the first time since Kevin Bacon’s turn in the first movie, we see actors who had actual careers after the flick in question. Final Chapter offers two such performers: Crispin Glover and Corey Feldman. I never thought much of the latter, but Glover manages to bring a little quirky energy to his role. Given the amateurish nature of most Friday performances, this makes a minor difference here. 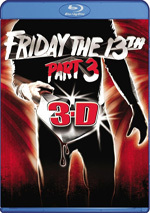 Friday the 13th - The Final Chapter appears in an aspect ratio of approximately 1.85:1 on this Blu-ray Disc. The Final Chapter presented a dated but positive presentation. Sharpness was fine. Some wide shots and interiors could demonstrate light softness, but the majority of the movie seemed pretty well-defined. No issues with jagged edges or moiré effects occurred, and I saw no edge haloes. With a good layer of grain, digital noise reduction didn’t seem to be a concern, and print flaws failed to mar the image. The movie went with a pretty natural palette that usually looked fine. Some tones could be a bit on the muddy side, which was a remnant of the era’s film stocks; I doubt the film ever featured dynamic hues, so the Blu-ray reproduced them in a positive manner. Blacks looked dark and tight, and shadows were decent; though a few low-light shots appeared a bit too opaque, most showed fairly good clarity. This was a more than watchable image that replicated its source well. In terms of audio, the Blu-ray included a DTS-HD MA 5.1 remix. Taken from the original mono – which failed to appear here - don’t expect a whole lot from the soundfield. Music benefited the most, as the score boasted good stereo delineation and the iconic “ki-ki-ki” elements spread around the room. Otherwise, the mix focused on general ambience. Scenes like the rainstorm showed nice involvement but the majority of the movie remained restricted, so surround usage was minor. Audio quality seemed decent for its age. Speech came across as reasonably natural, though some brittleness occurred; the lines were usually positive but they showed occasional roughness. Music sounded clean and bright, with decent range, while effects were more than adequate; though they lacked great power, they showed acceptable clarity. This was a workable but unexceptional remix. How did the Blu-ray compare to the 2009 Special Edition DVD? I thought the DTS-HD track showed a slightly broader soundfield and stronger music, but speech tended to be more distorted. Visuals offered the more obvious upgrades, as the Blu-ray looked cleaner and tighter than the DVD. The Blu-ray echoes old extras, and we start with two separate audio commentaries. The first comes from director Joe Zito, screenwriter Barney Cohen and editor Joel Goodman. All three sit together for this running, screen-specific look at studio and budget pressures, MPAA concerns, story and characters, editing, music and cinematography, killing Jason, cast and performances, gore and effects, locations, and a few other production topics. Though the track occasionally sags due to dead air, the participants usually offer a good look at the film. They interact well and seem happy to delve into the movie’s creation. Despite some gaps, the commentary moves well and turns into a satisfying discussion of the flick. Next comes a “fan commentary” with horror filmmakers Adam Green and Joe Lynch. They also sit together and provide a running, screen-specific chat in which they offer an appreciation for the film. They tell us a little about the production but mostly get into their thoughts about it. Tracks like this usually degenerate into little more than gushing praise. This one includes a little of that, but the participants are too irreverent for this to become an annoyance. Not that they come across like smarmy jerks, though; they clearly love the movie, and their feelings come through in their comments. We don’t learn a ton about the movie here, but the track proves to be enjoyable and fun nonetheless. Excerpted from a long documentary on a 2004 bonus disc, The Friday the 13th Chronicles, Part IV runs 13 minutes, 16 seconds and includes remarks from Zito and actor Corey Feldman. The program covers new ideas, casting, creating some of the kill scenes, and shooting the end sequence. It’s a tight little look at the movie, even though it feels a little weird when separated from its original place. Also trimmed from a 2004 piece, Secrets Galore Behind the Gore lasts 13 minutes, 30 seconds and features special makeup effects creator Tom Savini; we also hear a little from instructor Chris Pirt and students Danielle Noe, Anthony Ortiz and Robert Lucas. As one might expect, the featurette mainly concentrates on the nuts and bolts elements of creating the visual effects. Savini delivers good notes about his work in this informative clip. Continuing a series from the first three Blu-rays, Lost Tales from Camp Blood – Part 4 runs six minutes, 22 seconds. This gives us a short film in the Friday vein. The first three were pretty lame, and Part 4 doesn’t fare any better. Maybe somebody likes these things, but I take nothing from them. A collection of Slashed Scenes goes for 15 minutes, 20 seconds. We find a slew of silent clips narrated by Zito. These are really just outtakes, as no unused story points appear. Instead, we see raw footage of stunts and gore. None of this becomes especially interesting, though the compilation offers a decent look at the basic effects work. 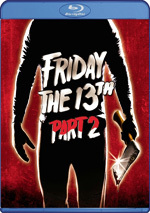 Next we find a featurette called Jason’s Unlucky Day: 25 Years After Friday the 13th: The Final Chapter. In this 11-minute and three-second piece, we hear from Zito, Cohen, special effects creator Tom Savini, and actors Ted White, Kimberly Beck, Bonnie Hellman, and Erich Anderson. “Day” looks at story issues, cast and performances, gore and effects, and some thoughts on the series. While it includes a lot of good information, “Day” jumps around so much that it becomes a bit incoherent. It feels ADD in the way that it flits from one topic to another and rushes through its subjects. I like the material we get but would prefer a longer, more in-depth take on the film. More deleted footage shows up via The Lost Ending. The silent clip goes for three minutes, 22 seconds and comes with narration from Zito and Beck. It shows a dream sequence that would’ve finished the film. It’s not great, but it might’ve been interesting, especially since so many of the Friday flicks used similar fake-out finales. The Crystal Lake Massacres Revisited Part I lasts 18 minutes, 10 seconds and provides a faux documentary that examines the events of the first four Friday movies. It looks at the killings from a mix of angles and comes across as reasonably entertaining, especially when it points out the more absurd aspects of the series. Some poor acting bogs it down, but it’s still clever enough to succeed. In addition to the film’s trailer, we finish with Jimmy’s Dead Dance Moves, which lasts two minutes, nine seconds and includes a few notes from Zito. We see shots of Crispin Glover’s bizarre dancing; we get a mix of outtakes and bits from the final film. It’s an insubstantial piece. A film that totally failed to fulfill its title’s promise, Friday the 13th - The Final Chapter also fell short of any other distinctiveness. It did little more than rehash the same story, as it tossed out characters and situations an awful lot like those of the first three movies. The Blu-ray provides generally good picture and audio along with a satisfying set of supplements. The film flops but the Blu-ray reproduces it well. 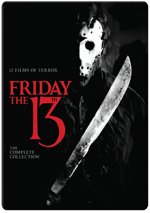 Note that as of September 2013, this Blu-ray version of Final Chapter appears only as part of a 12-film set called “Friday the 13th: The Complete Collection”. 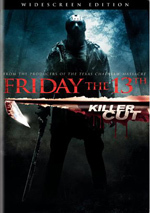 This includes films 1 through 8 as well as Jason Goes to Hell, Jason X, Freddy Vs. Jason and the 2009 reboot. It also throws in a bonus DVD and some other non-disc-based materials.